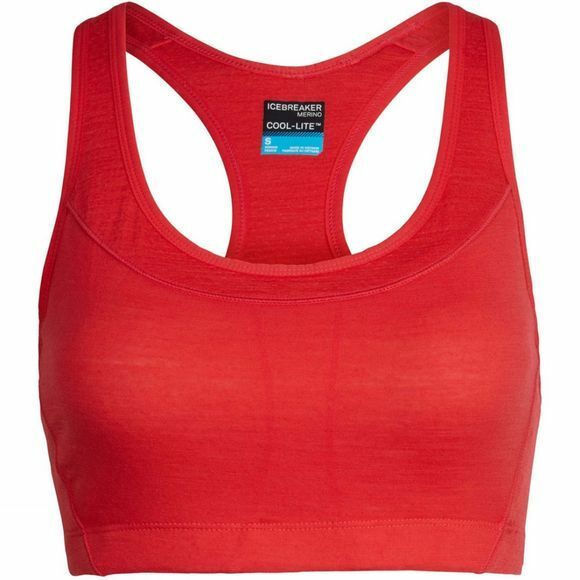 The Womens Meld Zone Sport Bra from Icebreaker is combining a classic racerback silhouette with a technical fabric design that’s ideal for active pursuits in warm weather, the Meld Zone Sport Bra provides medium support and maximum breathability. This active, slim-fit bra features our super-soft jersey corespun fabric, which uses nylon threads wrapped in merino wool for added durability that retains incredible next-to-skin softness, as well as natural Tencel and a touch of Lycra for stretch and comfort. In key areas, the Meld Zone features panels of eyelet merino mesh, to amplify ventilation when you’re on the move in hot conditions. Cup inserts provide enhanced fit and support, while flatlock stitching and no side seams eliminate chafing.